Asia and South America will wrap up Confederation tournament play. Asian 2019 Women's World Cup spots were clinched while South American Women's World Cup spots still up for grabs. With all Asian Women's World Cup qualification spots filled, Asia entered a single elimination bracket stage to determine the 2018 Asian Cup winner. The Asian Cup concluded on Friday April 22. South America entered the Final Stage Group of the 2018 Copa América Feminina tournament. The top two squads of the Group earn an automatic spot in the 2019 Women's World Cup. Australians and NWSL players Sam Kerr (Chicago Red Stars), Kyah Simon (Houston Dash), Alanna Kennedy (Orlando Pride), Emily van Egmond (Orlando Pride), Steph Catley (Seattle Reign), Ellie Carpenter (Portland Thorns), Hayley Raso (Portland Thorns), Katrina Gorey (Utah Royals FC) and Lydia Williams (Seattle Reign) will take on rivals Rumi Utsugi (Seattle Reign), Nahomi Kawasumi (Seattle Reign) and Japan in the AFC 2018 Asian Cup Final. This will be the second meeting between Australia and Japan this tournament. In the first meeting Australia and Japan played to a 1-1 draw. Chicago Red Star Sam Kerr scored the equalizer in the 86th minute. The draw was good enough to for Australia to finish atop the group. The draw result would also clinch a spot in the Asian Cup semi-final and a 2019 Women’s World Cup birth for both teams. Utsugi got the full 90 minutes in the semi-final against China PR, while Kawasumi came off the bench in the 68th minute. Japan pulled away in the second half defeating China PR 3-1. Australia were forced into a penalty shootout against Thailand in the other semi-final. Thailand had almost pulled off the upset but Orlando Pride midfielder Alanna Kennedy saved the day by heading home a corner in the 91st minute. A glassy eyed Kennedy told Fox Sports of her game tying goal, “There was no way the ball wasn't going in the back of the net”. Seattle Reign Steph Catley would score on her penalty and Sam Kerr scored the last sending Australia to the Asian Cup final. Portland Thorns, Hayley Raso posted a picture with her leg in a brace on her Instagram account and was not in Australia’s lineup. The Asian Cup final was held Friday in Amman, Jordan. In 2015 Women’s World Cup, Japan eliminated Australia in the quarter-finals. Australia got some measure of revenge by dominating Japan in the 2017 Tournament of Nations. Sam Kerr, Emily van Egmond, Steph Catley, Alanna Kennedy, Ellie Carpenter and goalkeeper Lydia Williams were in the starting lineup for Australia. On the Japan side Utsugi would play the full 90 minutes on defence and Kawasumi would not get into the match. Australia would dominate the possession. Sam Kerr presence created a handball in the penalty area but Japan’s goalkeeper stopped Elise Kellond-Knight’s penalty shot. 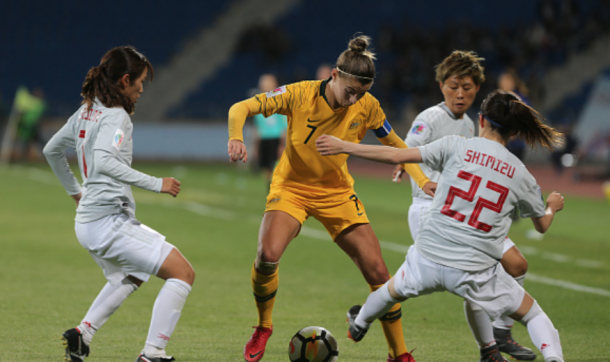 Along with Kerr, Emily Van Egmond, Steph Catley and Ellie Carpenter pushed Japan but Utsugi and Japan’s defenders clogged and frustrated Australia’s attack. Not even Kyah Simon, who came into the match in the 60th minute could find a way to score. 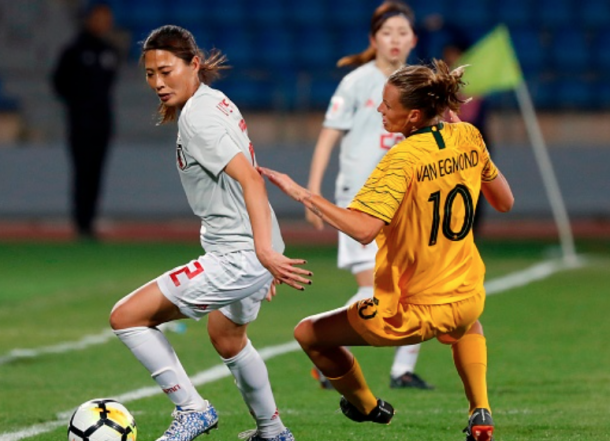 Japan would score the match’s only goal in the 84th minute when striker Kumi Yokoyama got around Alanna Kennedy to score a cracker of a shot beating Lydia Williams. Kyah Simon had a great chance at the end of injury time to equalize but Japan’s goalkeeper was able to get to the ball first. Simon's bid would be the final chance of the match as the referee blew the final whistle for a 1-0 Japan victory. This is Japan’s second consecutive Asian Cup Championship. 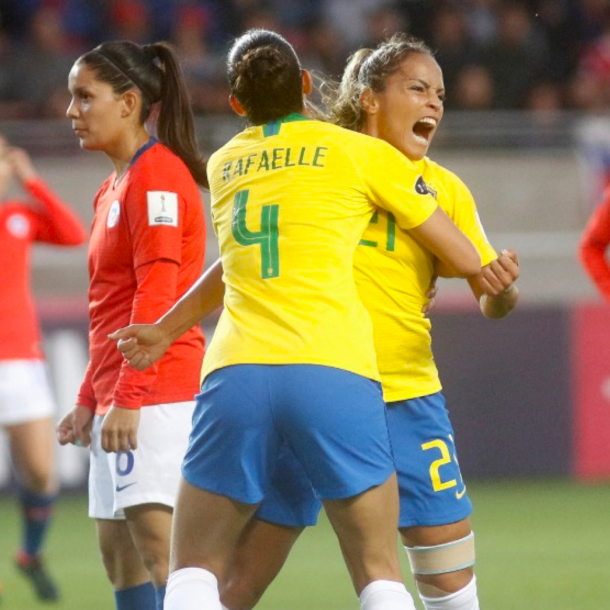 Thursday, Brazil officially qualified for the 2019 Women’s World Cup and are in good position to clinch their third consecutive South American Copa America Femenina title. Marta (Orlando Pride), Monica (Orlando Pride), Polina (Orlando Pride), Debinha (North Carolina Courage), Andressinha (Portland Thorns FC) and Brazil will play their final match against Colombia Sunday April 22. Earlier in the week, Brazil continued their winning ways in the final phase of the Copa America tournament. They first took care of hosts Chile 3-1 and handled Argentina 3-0 on Thursday. Marta was her dominate self in being involved in most Brazilian goals. Monica was strong on the backline and scored her second goal of the tournament in Brazil’s match against Chile. Debinha has come off the bench in both matches adding her third goal of the tournament against Argentina. Andressinha has also played well coming off the bench in both matches. While Polina has not seen much time in the tournament, look for her to get some minutes in Brazil’s final match. With the Championship practically locked up, Brazil will most likely rest their regular starters and give younger players like Polina, Andressinha and Debinha a start in the final match. 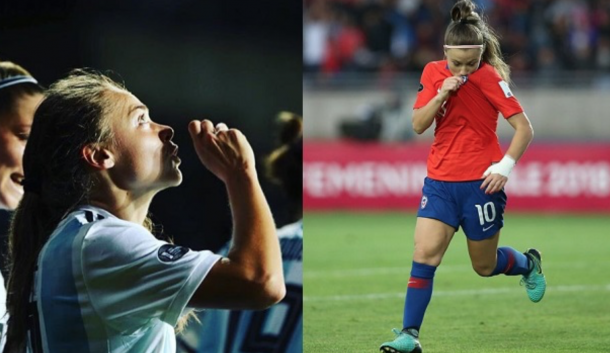 Washington Spirit midfielder Estefania Banini has her Argentina squad are in good position to qualify for the 2019 Women’s World Cup. Argentina beat Colombia earlier in the week and currently hold the second South American automatic World Cup spot. Banini and Argentina need a win or draw against Chile to book their ticket to France. Argentina’s last Women’s World Cup appearance was in 2007. Yanara Aedo of Chile, Banini’s Washington Spirit teammate, will look to spoil Argentina’s automatic World Cup bid. Chile were beaten by Brazil and drew 0-0 against Colombia this week. Aedo and Chile currently hold third place in the final group phase. Chile need a win against Argentina and hope for a Colombia draw or loss against Brazil on Sunday. If Chile are able to pull off a victory, they will jump ahead of Argentina to earn their first Women’s World Cup appearance. A draw or loss could end Chile’s run to the World Cup depending on the Brazil vs. Colombia outcome. Finishing third in the group will not be the end of Chile’s or Argentina’s Women’s World Cup dreams. Third place must play a two-legged inter-confederation playoff against CONCACAF tournament fourth-placed team. The winner of the playoff will earn the last Women’s World Cup qualifying spot. Colombia can still spoil the World Cup hopes for one if they are able to upset Brazil. The drama will all unfold Sunday April 22 in Chile.